Get inside tips for selling new homes! New home construction offers a different set of challenges and opportunities than re-sales, short sales and foreclosures. 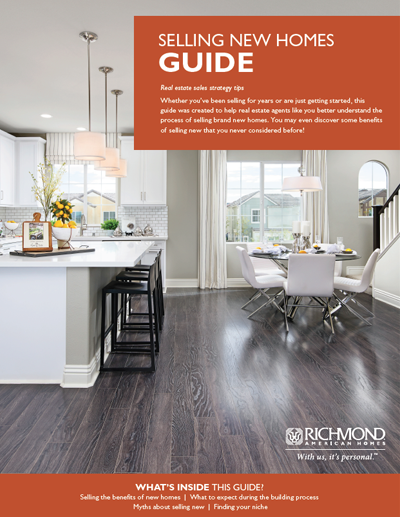 We developed this guide to help real estate agents leverage the top selling points of new homes and understand the unique emotional response many buyers have when building a home. Sign in or sign up to get your free copy today! © 2017 Richmond American Homes; Richmond American Homes of Arizona, Inc. (a public report is available on the state real estate department’s website), Richmond American Construction, Inc. ROC #206612; Richmond American Homes of Maryland, Inc., California Bureau of Real Estate – Real Estate Broker, Corporation License Number 01842595; Richmond American Homes of Colorado, Inc.; Richmond American Homes of Florida, LP, CBC1258074, CBC1257429; Richmond American Homes of Maryland, Inc., MHBR #299; Richmond American Homes of Nevada, Inc., Nevada Contractor License #0026417; Richmond American Homes of Oregon, Inc., CCB #: 218193; Richmond American Homes of Utah, Inc. (866.400.4131); Richmond American Homes of Virginia, Inc.; Richmond American Homes of Washington, Inc.